Rate this Article Although, the VR industry currently hasn’t reached the Apple Mac, the Apple iPhone on the other hand is in the midst of the VR revolution. Let’s take a look at the options available for this amazing smart phone when it comes to running VR applications. Since Apple Computers started in the late 1970’s, the company has always been in the forefront of personal computing. The introduction of the Mac in the early 80’s focused on Apple’s drive to focus on compact plug-and-play computing and its dominance in the graphics and publishing industry. With the emergence of mobile devices and computing as well, Apple again took the lead with the introduction of the iPod, the iPad and the iPhone. As far as personal computers where concerned, the continual evolution of the iMac and IBook models continues Apple’s place in the world of computers. However, since Apple has abided by the principle of compact nearly closed architecture design when it veered away from it’s Apple 2 line of computers, the venerable desktop PC which continued the open architecture design has gained one big advantage, high-end VR (Oculus and Vive) which uses high-end GPU cards that can be readily plugged into a mother board slot of a high-end PC. This caused top side VR development to be focused on the PC leaving the Mac currently with no practical way to access VR. Fortunately, low-end VR is widely available for mobile devices and Apple has IOS for its iPhone line which is very much supported by VR. Mobile VR relies on the iPhone to provide the processing, display and sensors used by the VR app. A mobile headset provides the special lenses and way to mount the iPhone onto the face of the user. Using a mobile headset with an iphone is a much much simpler affair compared to donning a high-end Oculus or Vive that is tethered to a PC. You simply run the VR app and insert the phone into the provided slot on the headset. Though the experience may not be as realistic as the high end HMD's, the VR you get is good enough to provide you with an immersive experience and a pretty good idea of what virtual reality is. There are several brands and models of iphone compatible headsets as most of these conform to the measurement specifications of a standard Iphone model. It would be best to find out about the headset specs before acquiring one to make sure that it can accommodate your iphone whether you have an iphone 5 or an iphone 7. Most mobile headsets are general in use as they can accommodate other smart phones of the Android variety as well like the Samsung Galaxy S Series, HTC One and Google Nexus among others. Here are a few examples of the most popular mobile headsets that can work with your IOS iPhone. 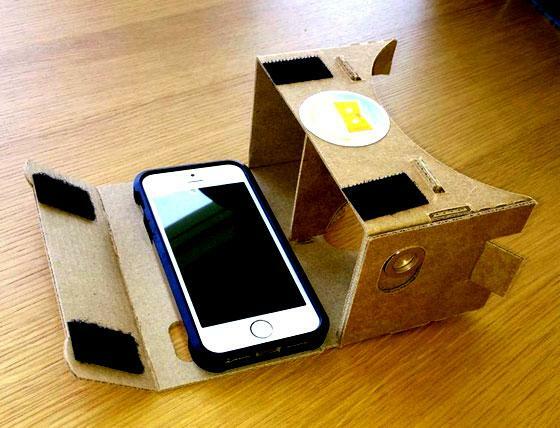 Google Cardboard Platform: The headset was actually an original design by Google made open to the public for a DIY smart phone holder that will let you view a VR app running on the phone. Several manufacturers have capitalized on this and have made available cardboard viewers from the simplest hold it to your eyes to the more advanced adjustable lenses with head strap. Cost depends on which options you choose whether you purchase it in kit form or ready to use. These will normally fit iPhones in general from the iPhone 5 to 7. Prices range from around 7 to 20 USD and come in different brands like Google, Unofficial Cardboard, Knox, I am Cardboard and DODO case. VR apps are readily available through the Google Apps store and you can usually purchase a cardboard at Amazon. Merge VR 360: The company that created this mobile headset went a step further by using soft foam instead of cardboard. It was designed very well and is one of the most comfortable to use. Also, the iPhone fits evenly into the slot to insure that it stays there. The focal distance of the lenses can be adjusted and a strap holds it in place on your face. There are 2 buttons at the top that can be used to interact with the running VR app. A small window at the front can be opened to expose the iPhone’s camera for pass through video and AR applications. The Merge is compatible with all Google Cardboard apps as the company is pushing its use in both gaming and education. It's also available at Amazon and has a current price of around 50 USD or a little bit more. The Homido VR is one of the most popular mobile headset brands available. Homido can be described as one of the high-end headsets for mobile VR. Well designed, padded for maximum comfort and uses special lenses that provides a 100 degree Field-Of-View. Also, the distances of the lenses to your eyes can be adjusted as well. There are 3 settings for near sighted, normal and far sighted vision. Again, there's an opening at the front to allow your iPhone camera. Homido has an app platform that features a catalog of VR apps that can run both on IOS and Android phones but whether you get your apps from Google or the iStore, it will still work as your phone will be the one to run it and not the headset. The Homido has a price tag of around 30 to 80 USD (depending on the model) at Amazon. Note that none of the above examples come with their own audio device so the choice of the best ear or headphones that will fit well with the headset will be up to you. With the hardware needed to run the VR programs developed for the IOS, it would be a matter of downloading VR specific mobile content from available sources online. Some of the headsets provide their own optional online stores while the more generic ones will work just fine from wherever you get your apps as long as it runs fine on your iPhone. Apps can range from 360 degree picture viewers to full rotation videos like those available on You Tube. Apps are usually classified as gaming and entertainment, informative or educational. Games from horror, shooters, adventures and even those educational in nature provide an immersive enough experience to feel what it's like to be inside the game itself. On the other hand, a 360deg viewpoint expands a sequence of still pictures or a moving video or film like never before. Information given this way while providing an interactive environment can result in a much deeper and detailed understanding of a certain topic, event or situation. Newspapers like the New York Times and informative media like Discovery are spearheading the use of VR to provide their content and informative experiences as well. There is even an app called DinoTrek that let's you somehow feel what it's like to be in the middle of the Dinosaur age with all those big behemoths looking at you, probably in a very hungry way. App prices ranges from the totally free to an amount normally less than 50 USD but will really depend on the value of the app itself as some may be for use in specific non-general applications. With the continued development in VR, more and more apps are being developed not just for entertainment, information or education but for specific useful applications. A lot of research is already being done on the medical application of VR like in physical and mental therapy which includes the treatment of stresses and even eye problems. Eye treatment apps usually use focal exercises that can improve ones vision. It would be just a matter of time for all of these to be available for IOS and the iPhone.